Hello! Welcome to my blog page! This is a page dedicated to comic books, comic book movies, pop culture news and other stuff that I find interesting. I will try to update this page as much as possible with the junk I find interesting. I hope you find it interesting too. Well, while comic books can be compelling, imaginative and extremely well written, they aren’t exactly Shakespeare. Even though I love reading them, the title of the blog serves as a reminder to just have fun with them. Ok, cool. So what about you? Who are you? I’ve been reading comics for more than 30 years! I remember the day I started pretty clearly. When I was about 3 or 4, my dad came home from work and among the little treats he usually brought home, he brought an issue of the Incredible Hulk, Daredevil and Power-Man and Iron Fist. It was all over after that. All night long we laid on the floor, reading these comics and even though I was too young to read them myself, I listened intently while he discussed and explained Daredevil’s powers, what happens when Hulk gets mad and Iron Fist’s prodigious use of Kung-Fu. From then on out, I wanted to read as much as I could (not limited to comics of course). I would read everything from the Marvel and DC universe. From then on out it was Spider-Man and his Amazing Friends on Saturday morning, Batman birthday cakes, Fantastic Four bed sheets, watching Superman movies and on and on and on. 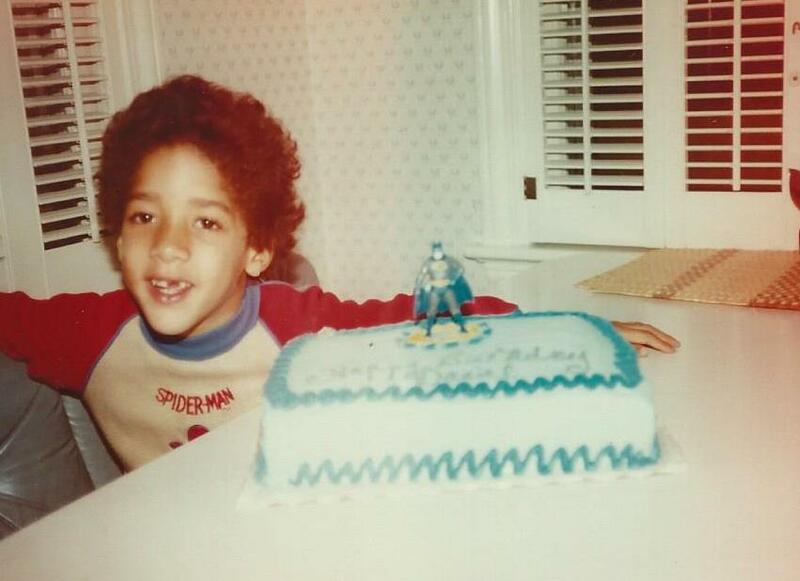 My 6th birthday party and i’m proudly rocking the Batman ice cream cake and Spider-Man t-shirt. In 1984, I was at a birthday party and while most of the kids were playing with toys with the birthday boy, I noticed a TV on in the other room. I poked my head in to see what was on and noticed something strange on the tube. Something I had never seen before. Strange machines were walking across a frozen wasteland shooting lasers at peculiar looking ships, a man clad in all black with a deep raspy voice strode through frozen hallways looking for someone called “The princess”. Yep, you guessed it. The Empire Strikes Back. Thus began my second great love affair. So there you have it, I’m not going to go through all my major milestones with comics, there just isn’t enough bandwidth available 🙂 I just hope you enjoy my blog as much as I enjoy making it! How often will you update the page? Good question! I will update the page as often as I can. I work a full-time job and full-time responsibilities. The great thing is that there is an app for this blog site so I can use my phone and/or iPad to perform updates. So there may be a few updates everyday or every week/month/year etc. I’m still pretty new at this blogging stuff so lets just see how it goes. So there you have it. That’s pretty much all I can come up with for now in the “About Me” section. I wanted to take the time to write this to let you all know, yes there is a human on the other side of this computer and he’s doing his best to keep you immersed in his world! Anything else I add will probably be in the form of a blog post. So in closing, again I hope you enjoy the site, hit that follow button and check in often for fun comic book and pop culture updates!